In a small bowl, add the dry rub ingredients and mix well. Paint each chicken drumstick with a light coat of yellow mustard. Season each drumstick with the dry rub mix (about 1 teaspoon per drumstick). Build a charcoal fire for indirect cooking by situating the coals on only one side of the grill, leaving the other side void. 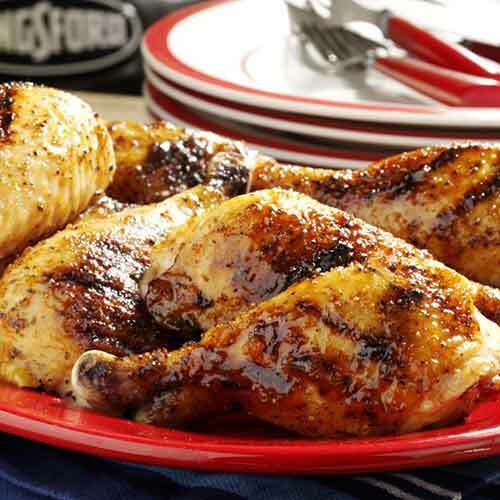 When the temperature inside the grill has reached approximately 300°F, place the chicken drumsticks on the grill over the side void of charcoal. Close the grill lid and cook the chicken for 40 minutes with indirect heat, or until the internal temperature reaches 175–180°F. While the chicken is cooking, combine the peach molasses glaze ingredients in a blender or food processor. Blend the glaze until smooth and pour into a shallow bowl. Remove the chicken from the grill, submerge each drumstick into the glaze, and place them back on the covered grill over indirect heat for 8 minutes or until the sauce caramelizes. Remove from the grill and serve. The apricot in the glaze is complemented by the apple fruitwood in the charcoal.